100% Amazonia specializes supplying renewable non-timber forest products from the Amazon rainforest and helps turn them into unique ingredients for the food supplement, beverage and cosmetics industry. Located in the Amazon, 100% Amazonia was established to consolidate its local influence and production base. 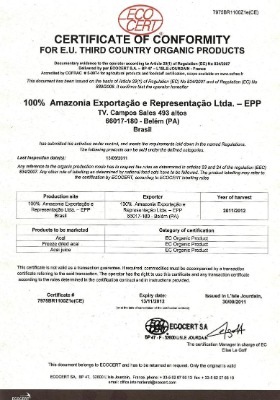 We have been active in processing and promoting Amazonian based products since 2004 but our experience in International trade, dates back to 1992. Additionally to the trading activities, 100% Amazonia provides strategic consulting services for product development, supply chain and market access. 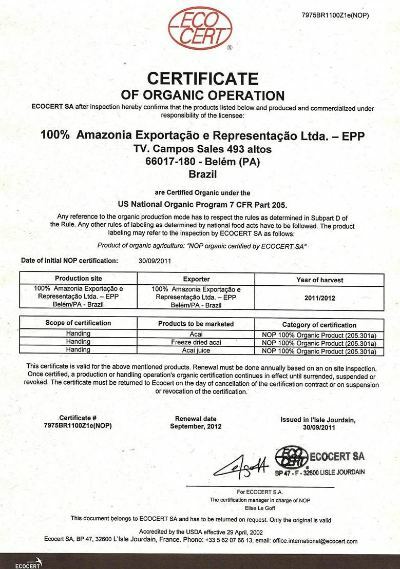 The lines are ISO22000 (HACCP) certified, and products are either organic certified or compliant for countries of the European Market, United States and Korea.The product line includes: premium freeze-dried powders, clarified juices, concentrated liquid extracts, purees, pulp fruit and Amazonian seed oils. The application are extended to cosmetics such as shampoos, soaps, moisturizers, also natural and organic foods (natural juices, energy drinks, yogurt, cereal bars, desserts, among others). The products are minimally processed to maintain the original nutritional properties. 100% Amazonia has a unique strategic position among the agro-processing community, as well as the co-ops for fruit and seed pickers. Besides, our know-how and networking ensure authentic products with high added value to our customers.Our product line is carefully chosen to add nutrition and actives to our customer base. We do not work with carrier extracts, only with pure products. We are specialists in our field, not simply traders.Currently, 100% Amazonia exports to more than 40 countries in all continents. our credit scores are available at DNB.com through our DUNS registered number.Please visit and download our catalogs at: www.issuu.com/100amazonia. 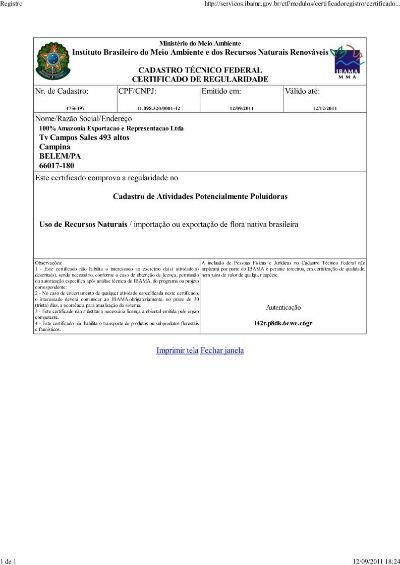 Instituto Brasileiro do Meio Ambiente e dos Recursos Naturais Renovaveis (IBAMA) is the government agency responsible for regulating the natural resources from Brazil. 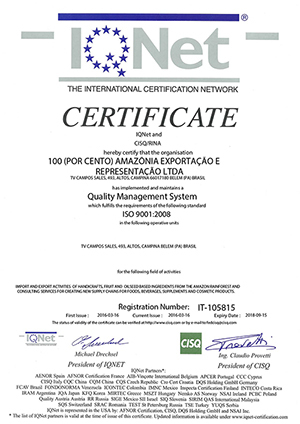 IQNet and CISQ/RINA certified that we have implemented and maintain a Quality Management System for the following field of activities: import and export activities of handicrafts, fruits and oilseed based ingredients from the amazon rainforest and consulting services for creating new supply chains for foods, beverages, supplements and cosmetic products.